They are covering a bigger part of the homes: kitchen, bathrooms, bedrooms etc. The pallet to choose from is very vast, from domestic to exotic and from straight installation to borders, inlays etc. Because of the multitude of options, choosing is not easy. But if you know what to look for, and if you follow the proper steps, selecting wood floors could be very time effective and enjoyable. There are many species of flooring out there, exotic as well as domestic. In order to simplify this process the first thing you want to do is narrow it down to 3 species. So answer yourself this question: are you looking for a domestic wood or an exotic one for the flooring in your home? Choosing a species requires more than selecting a color that will blend with the inside of your home. Understand the factors that will affect the look of your floor: country of origin, the type of sawing, dimensional stability, durability, ease of finishing etc. The natural characteristics of a certain type of wood can influence the life span of your floor as well as its looks. The approximate content of heartwood (the harder part of the tree) or sapwood (the softer, younger part of it) in a pallet may affect the way the floor will take the finish or stain. 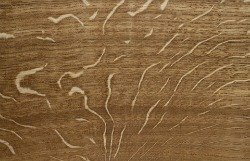 The grain as well as the texture of the wood are important factors to have in mind. The grain will drastically influence the aspect of your floor. The amount of grain, its direction, the existence of nuts and their size are all factors to take into account when selecting your floor. The manner in which a wood is cut, it will affect its appearance. Wood flooring is either plainsawn, quartersawn or riftsawn. 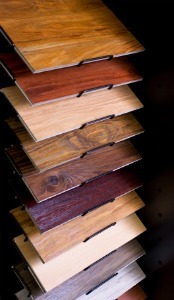 Plainsawn is the most standard, most economical type of wood flooring. It is found in a variety of widths and it generates very little waste. Quarter sawing generates narrower boards, with more waste produced, therefore making it more expensive. Quarter sawn flooring planks bends and cups less, wearing more evenly. Riftsawing is very much like quartersawing but at a different angle. It produces even more waste than quartersawing therefore making it even more expensive. The factors that affect wood flooring installation and sanding should be considered as well. Relative density is a very important property to take into account. The denser a species is, the harder it will be to install it. The relative density of some species will make them crack when nailed, while others will only hold a particular type of nail. The relative density will determine how difficult it is to cut that certain species of wood. The resin content makes a huge difference when sanding the wood floor. The resin content will determine how fast the sanding paper will clog, therefore determining the amount of time and materials required to sand a floor. The chemically compounds or oils contained by certain species might react with certain types of floor finish preventing it from drying or completely changing its color. Some species won't accept stains as good as others, brazilian cherry, mahogany, maple being just some of them. Begin by deciding which type of floor you will buy: solid or engineered flooring. Understand the differences (link to solid vs engineered) between the two, the pros and cons of each one of them and, most importantly, which one of them is recommended for your house. Once you've decided which type of floor you like (need), start looking into the pattern issue (link to understanding flooring patterns). Do you want a strip flooring or a parquet installation, is straight installation something that you prefer, or a diagonal installation will suit your house better? Do you like the herringbone pattern, or would you rather have it installed straight with a different color border around the walls? This is a very important step, since it will dramatically affect the look of your floor, once it's finished. Once this step is finished, the next one would be to select a board size (link to board size page). There are many sizes available out there, but only one of them will properly suit the space you leave in. Take a good look at your home and decide what will suit you better, wide, medium or narrow? If in doubt, consult a contractor (link to contact us) . A good flooring contractor will always have the answers you are looking for. The next decision you will have to make is, whether you will have the floor finished in your home, or buy it prefinished to begin with. Each one of these options has its pros and cons and you should be very much aware of them (link to page prefinished vs unfinished), before deciding which one is going to be your choice. Finally, you will have to decide on the grade of your floor (link to flooring grades page). This is one of the steps, many people are focusing on, without actually understanding whether it's important or not. You shouldn't ignore it either; just make sure you understand what it's all about. Bottom line is, upgrading to hardwood flooring should not be the hassle many people make it to be. Inform yourself, choose the right contractor (link to contact us page), take advantage of his knowledge and selecting the flooring for your house will become an easy and enjoyable task.